There's no attempt at subterfuge here. England's Pastel Jack is definitely on to something good with their debut album Trojan Horse. The band easily blends melodic classic heavy rock and metal with it's modern counterpart in an effective and entertaining package. Pastel Jack: just try and cross the bridge. Actually, most every song here begins heavy, even with some thrash overtones, only to reveal melodic and harmonious guitar lines and vocal arrangements. This formula works well with the title track, Flatline, The Gentle Art of Combustion, Synergy, or Cold Light of Day. Sometimes Pastel Jack simply goes for heaviness and speed as on Methematic and Day Like You. These songs, with the delicately laborious nature of Down to a Sunless Sea, the formula has mixed results. 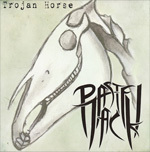 But that latter song gets a boost from a strong guitar solo, which are generally good throughout Trojan Horse. The real wildcards may be the longest pieces Part Two You Sick Machine and Swan Dive. The former seems merely to rumble along with more momentum than substance. The latter's first third is slow and melancholy, only to become heavy and melancholy. While the second song trumps the first, I'm not sure what direction the band is taking with their music on either one. Nevertheless, Pastel Jack's uncommon ability to inject melody and classic metal lines into their heavier modern metal makes for a promising sound, and a band to watch in the years to come. Recommended. Pastel Jack's uncommon ability to inject melody and classic metal lines into their heavier modern metal makes for a promising sound, and a band to watch in the years to come.